Title NoteTitle based on contents of fonds. Administrative/Biographical HistoryJennie Phillips (birth name Jennie Lifschitz, b. July 8, 1924, in Montreal, Quebec, Canada) was perhaps the only Canadian-born Holocaust survivor. Jennie was born to Abraham Lifschitz (b. 1899; d. 1970) and Paula Blumberg (b. 1897; d. 1941), Jewish immigrants from Liepāja (Libau), Latvia. Their eldest son, Ruben, was born in Liepāja in 1920. Jennie and her older sister, Dora (b. 1922; d. 2005), were born in Montreal. Shortly after Jennie was born, Abraham and Paula separated and Paula and the children left Montreal for Liepāja in November 1924. In Liepāja, Paula and the children lived in poverty. Jennie and her siblings were separated so that their mother could work. In 1931, Abraham sent for the two oldest children, Ruben and Dora, and they returned to Montreal to live with him. Jennie lived with her mother in Liepāja until her mother remarried in 1937 and moved to Telz, now Telšiai, Lithuania. Jennie went to live with her grandmother, Malke Blumberg (b. 1863; d. 1941). The Germans entered Liepāja on June 29, 1941. Mass shootings and massacres of Jews began almost immediately. On July 24, 1941, Jennie’s uncle, Hessel Blumberg, was shot and his wife and three children moved in with Malke and Jennie. Because Liepāja was a naval base and international port, it fell under the command of the Kriegsmarine, or the German navy. Jennie worked for the Marine Nachrichten Mittelbetrieb (Marine News Media Operations), a private home for officers and soldiers, as a domestic servant. On the night of December 13, 1941, Latvian policemen came to Malke’s apartment and arrested the entire family except for Jennie and her fourteen-year-old cousin, Bella, who was Hessel’s daughter. Jennie and Bella were spared the fate of their relatives, who were shot on the beach at Šķēde, near Liepāja, as part of the “Big Action,” the largest of what was later called the Liepāja massacres. The “Big Action” occurred over three days, from December 15 to 17. Paula died December 22, 1941. Jennie and Bella lived in their grandmother’s apartment until they were forced to relocate to the Liepāja ghetto on July 1, 1942, along with around 800 of the city’s remaining Jews. On October 8, 1943, the ghetto was liquidated and Jews were transported to Kaiserwald concentration camp in Riga, Latvia. There, Jennie’s Canadian birth certificate was confiscated. In March 1944, Jennie was transported to Reichsbahn (German Railroad) camp, a satellite camp of Kaiserwald. In August 1944, with the Soviets nearing Riga, Kaiserwald’s prisoners were transported to Stutthof concentration camp, near Danzig, now Gdańsk, Poland. While Jennie was waiting in the lineup for the gas chamber, there was a call for railway workers for Stolp, a satellite camp of Stuttholf. Jennie volunteered and was transferred there on August 26, 1944. On March 6, 1945, Jennie was transferred to another satellite camp, Danzig-Burggraben. The camp was evacuated and Jennie returned to Stutthof on March 22. After being evacuated by barge to Neustadt in Holstein, Germany, in May 1945, Jennie and her fellow prisoners were liberated by the British Army. 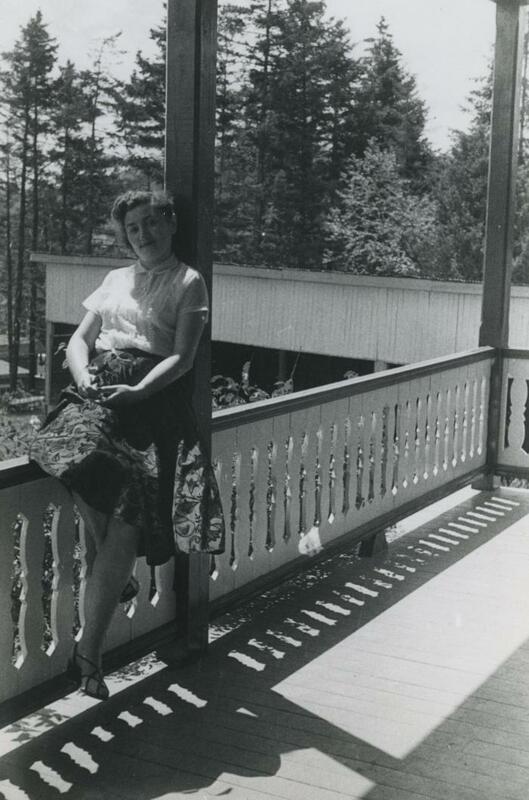 After recovering from typhus and living for a time in a displaced persons camp in Neustadt in Holstein, Jennie decided to return to Canada. Her repatriation was authorized in September 1945 and she arrived in Halifax, Nova Scotia, on March 2, 1946, as a “returned Canadian.” She was reunited with her father and siblings in Montreal. In November 1946, Jennie started working, first in a bakery and then in one of her father’s restaurants, eventually owning a restaurant of her own in Val-Morin. In 1947 Jennie had a daughter, Paula, named after Jennie's mother. In 1952, Jennie proposed marriage to Sender Mines (b. 1909; d. 1982), whom she had met on her first day at Kaiserwald, and the two married in a synagogue on March 22, 1953. In February 1954, Sender and Jennie moved to Vancouver, British Columbia, where they established a successful restaurant business and joined the Communist Party. They had three more children: a son who died at three days old; a daughter, Rachel; and a son, Michael. In 1967, Sender and Jennie separated. They divorced in 1981. In 1984, Jennie married John “Jack” Phillips (b. 1913; d. 2005) and the two lived in Prague and Moscow from 1981 to 1986 before returning to British Columbia. Jennie Phillips died August 9, 2005, in Vancouver. Scope & ContentFonds consists of photographs, vital records, personal notes, transcribed songs, correspondence and ephemera relating to the life of Jennie Phillips. Fonds has been arranged into the following series: JP photographs series (1912–1982), JP vital records series (1953–1979), JP personal papers series (1946–1987), Transcribed ghetto and camp songs series (1946), Stutthof Museum correspondence series (1984–1985) and JP ephemera series (1972). Immediate Source of Acquisition or TransferPhotographs taken before 1945 possibly in Abraham Lifschitz’s possession until his death in 1970. Records maintained by Jennie Phillips until her death in 2005. Records maintained by her daughter, Rachel Mines, until their donation to the VHEC in 2011. System of ArrangementFonds has been arranged into six series which reflect the major activities of Jennie Phillips, as well as thematic divisions as it came to the VHEC. All photographs kept in the order they were in at the time of their donation and placed in enclosures for preservation purposes. Select records only have been described at the item level. Other items have been digitized as media representations of fonds, series and file-level descriptions. Consult the archivist for more information. Date of DescriptionPrepared by Sarika Kelm in December 2016. Fonds consists of photographs, vital records, personal notes, transcribed songs, correspondence and ephemera relating to the life of Jennie Phillips. Fonds has been arranged into the following series: JP photographs series (1912–1982), JP vital records series (1953–1979), JP personal papers series (1946–1987), Transcribed ghetto and camp songs series (1946), Stutthof Museum correspondence series (1984–1985) and JP ephemera series (1972).